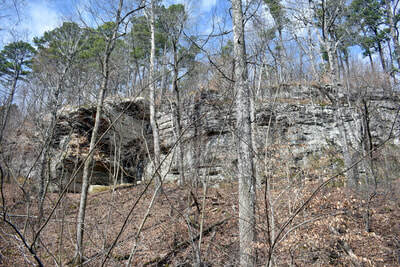 Friday, March 23rd started out sunny with mild temperatures predicted for the late morning and early afternoon. We decided to try the Alum Cove loop trail, which is a 1.2 mile walk. The main feature is the natural rock bridge that spans 130 feet. 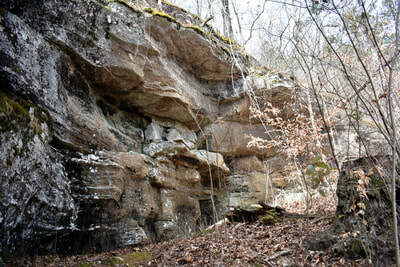 There are also bluffs and caves to explore along with a creek. 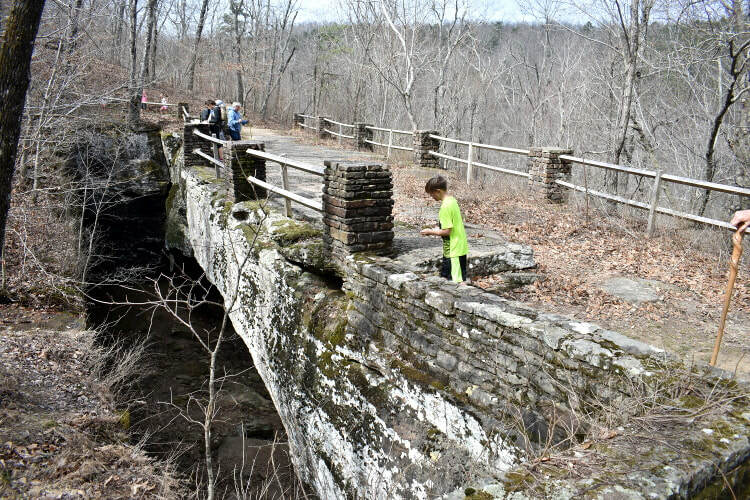 This was the last weekday of spring break for our local schools and also many of the colleges in the area and we were sure there would be many people taking advantage of the great weather to get out with friends and family.. 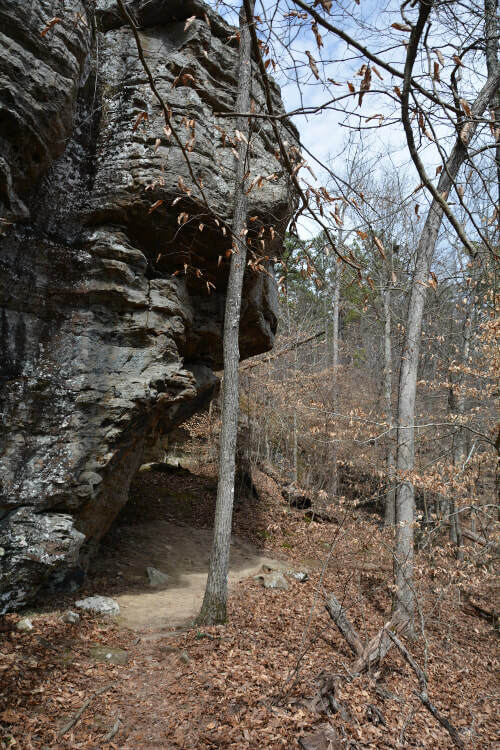 The Alum Cove National Recreation Trail is located near Deer, Arkansas in the Ozark National Forest. There are picnic areas, a pavilion and toilets. We parked and began our little walk. One family was unloading a couple coolers and told us they were going to have a nice picnic lunch before heading back home. They enjoyed the hike immensely! 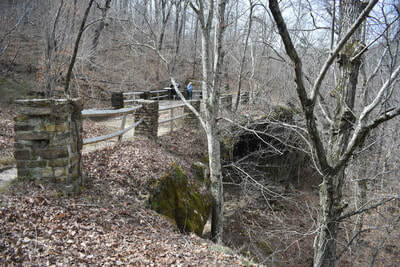 The trail led us down to the natural bridge. One nice thing we noticed while making our way to the bridge is all the benches that are positioned along the trail to help us old folks make it back up. Thoughtfully placed they were excellent places to rest. We came upon the Natural Bridge and it was magnificent. I had forgotten how big it was. 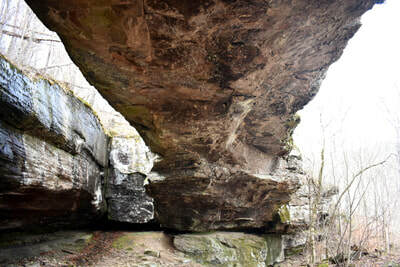 We visited with a couple groups who were also admiring this feature and taking pictures. Some were from Oklahoma, some from Missouri and of course some from our university at Fayetteville. 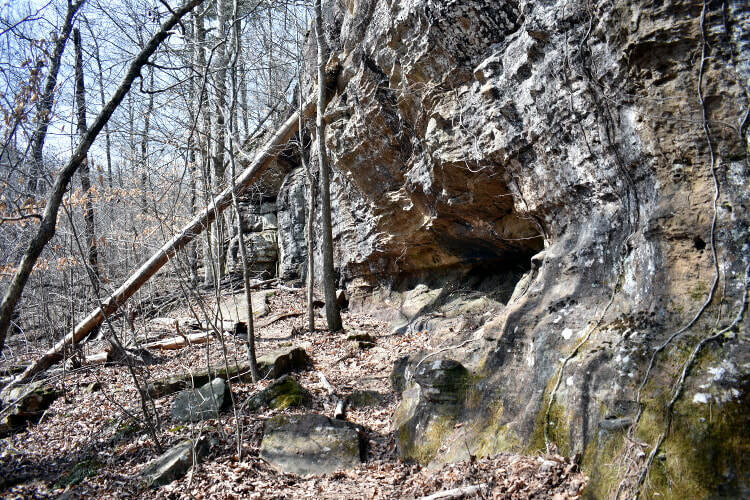 The weathering of this rock has exposed many geologic striations and colors. 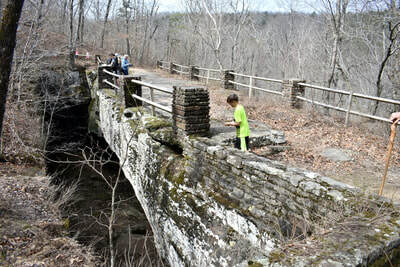 We spent some time on top and then went below to examine the bridge from underneath. 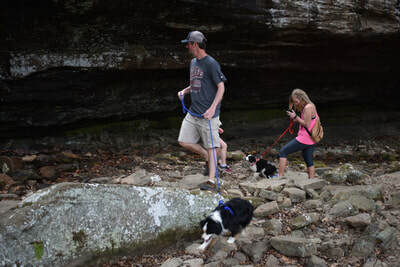 There was a couple exploring with us and they had their dogs with them. Cute! 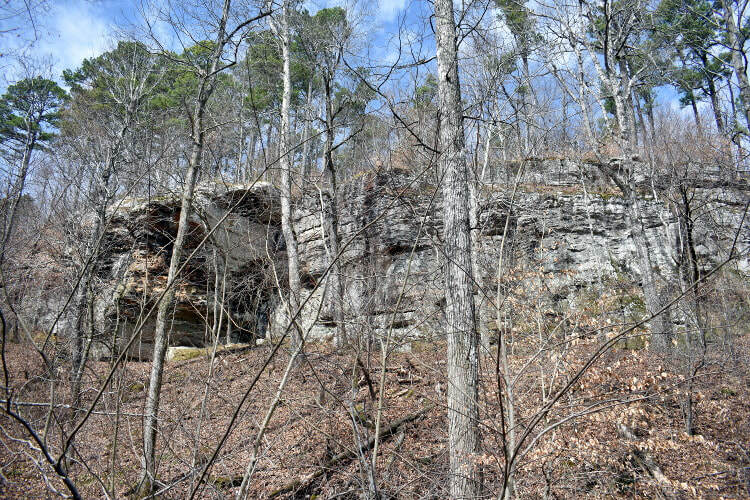 Bluffs Have Many Indian "Shelters"
We decided to take the left hand side of the loop trail and worked our way down the ravine, across the small stream which had very little water in it, and up towards the bluff line with the shelters. 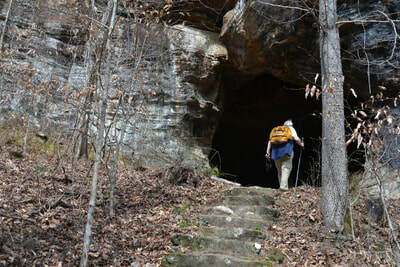 The access was good and I made my way up the rock steps to the entrance of the largest cave/.shelter. It was quite roomy inside and one could sit and imagine the early Indians making camp in these caves during hunting expeditions. 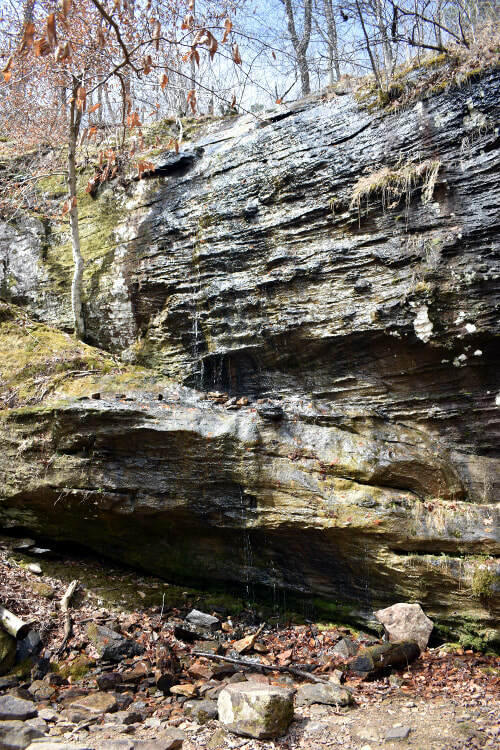 Water seeped from the bluff line providing fresh water at many points. 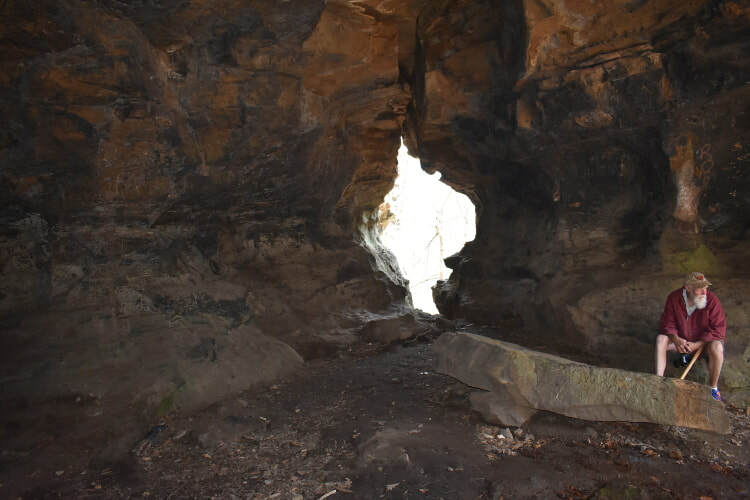 I found the colors of the rocks inside the shelters were quite beautiful however my camera could not record them accurately due to the low light conditions and my flash was not strong enough to illuminate the entire structure. 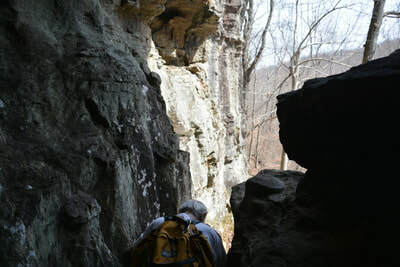 We squeezed out the rear opening and continued to follow the trail. We enjoyed examining some of the beautiful rock formations that were on display on this sunny day. 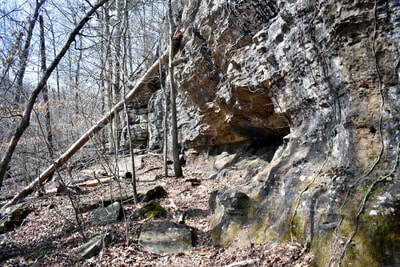 There were also more, but smaller shelters to examine. I am sure several of them were also used for early shelters. 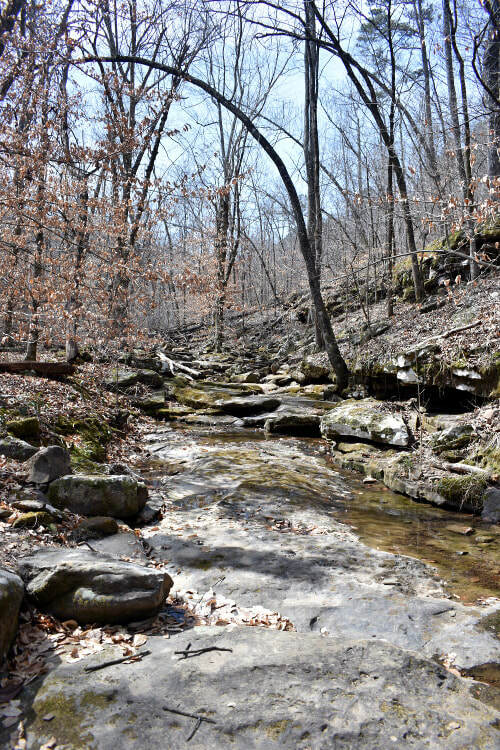 After walking the entire trail we crossed back over the small stream and began our walk back up the ravine to the picnic and parking area. 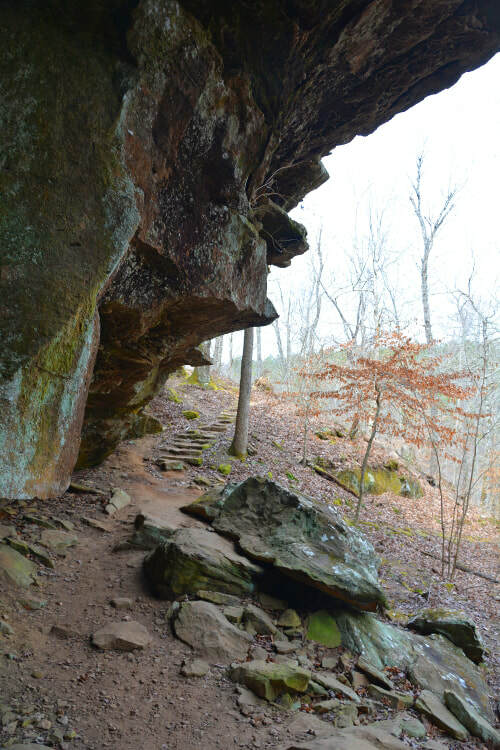 Those benches sure came in handy on the way up. We had a quick snack break then headed back home. Springtime in the Ozarks is a wonderful time to visit. 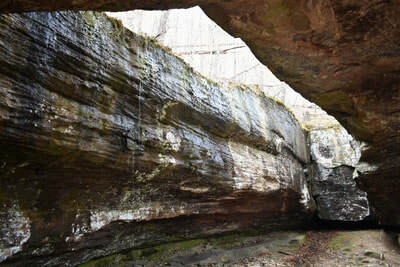 It is prime time for floating the Buffalo River. 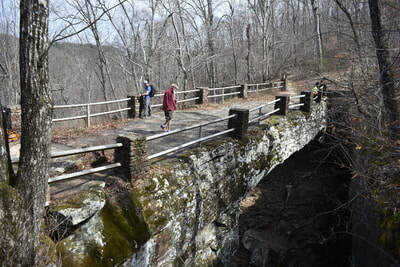 Redbud and Dogwood trees are blooming, and wildflowers are popping up all over. 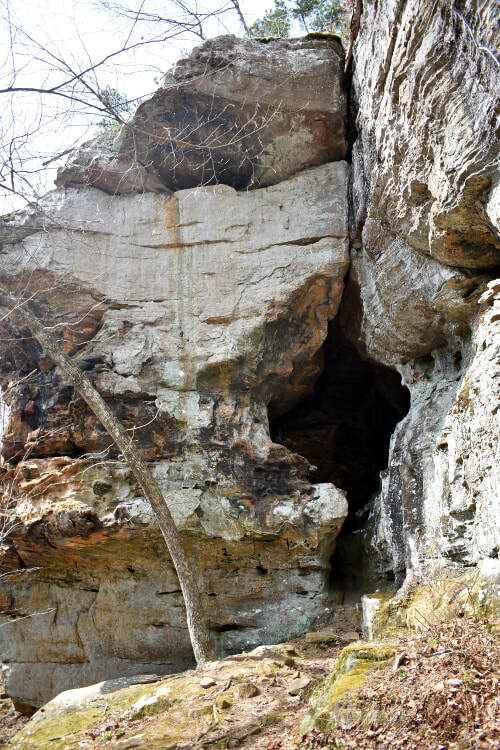 Grab the family or some friends and go for a walk in the Ozark Mountains.